Elegant Farmhouse Entrance Way Corner Shelf Brackets Solid Cast Iron, 13'', Set of 2 by Cast Iron Home Decor Collectibles at N Online Agency. Hurry! Limited time offer. Offer valid only while supplies last. Frame entrance way corners with these Elegant Design Extra Large Wall Shelf Brackets. 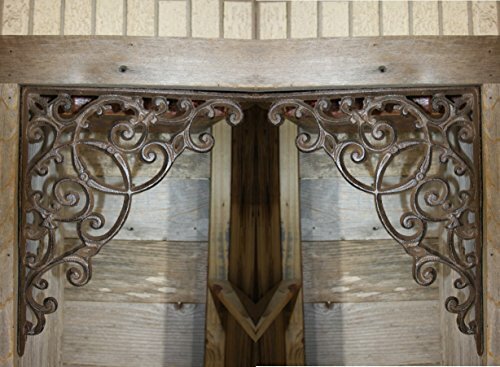 These are hand cast solid heavy duty cast iron shelf brackets. Frame entrance way corners with these Elegant Design Extra Large Wall Shelf Brackets. These are hand cast solid heavy duty cast iron shelf brackets. They are finished in a very nice rustic brown powder coat finish which inhibits rust. No hardware is provided. Solid Cast Iron, Hand Cast. Three dimensional design. These can be used with either the long or short side against your shelf or surface. These are finished in a nice rustic brown powder coat finish which inhibits rust. You can easily paint them to the color of your choice. Spray paints work great and are easy to use. Free Priority Mail shipping is included. We are in Southeast Texas and delivery time is generally 2-3 days. If you have any questions about this product by Cast Iron Home Decor Collectibles, contact us by completing and submitting the form below. If you are looking for a specif part number, please include it with your message.